In stock -This product will ship today if ordered within the next 8 hours and 8 minutes. 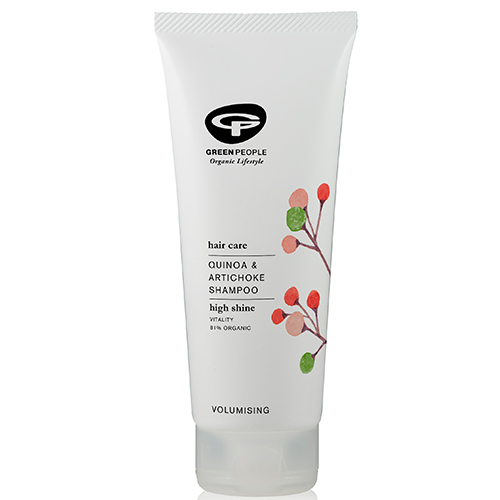 Green People Quinoa and Artichoke Volumising Shampoo reawakens your hair and reveals your best shine yet! Dull and lacklustre hair? Artichoke boasts deeply cleansing properties to remove mineral deposits which could be causing dullness, revealing the natural high-shine beauty of your hair. Whilst working as a protective shield to the cuticles in the hair shaft, artichoke leaf extract leaves the hair’s surface flat and smooth, giving shiny, sleek and frizz-free locks. Looking for volume? Quinoa coats every shaft, delivering body for hair that looks thicker and fuller. Aqua (Spring Water), Sodium Coco-Sulfate (From Coconut), Cocamidopropyl Betaine (Derived From Coconut), Decyl Glucoside (Derived From Corn), Aloe Barbadensis (Aloe Vera) Leaf Juice Powder*, Hydrolysed Quinoa, Ananas Sativus (Pineapple) Fruit Extract, Yucca Schidigera (Yucca) Stem Extract, Cynara Scolymus (Artichoke) Leaf Extract, Althaea Officinalis (Marshmallow) Root Extract*, Chamomilla Recutita (Chamomile) Flower Extract*, Aroma [Zingiber Officinale (Ginger) Root Oil*^, Citrus Limon (Lemon) Peel Oil*, Cymbopogon Citratus (Lemongrass) Leaf Oil*^, Citrus Aurantium Dulcis (Sweet Orange) Peel Oil*, Eugenia Caryophyllus (Clove) Bud Oil*^], Glycerin (Vegetable Derived), Propanediol (From Corn Starch), Gluconolactone (Natural Acidity Regulator), Benzyl Alcohol, Salicylic Acid, Sorbic Acid, Citric Acid, Citral*, Eugenol*, Limonene* . Apply a small amount to wet hair & gently work through to ends. Rinse hair thoroughly. Below are reviews of Green People Quinoa and Artichoke Shampoo - 100ml by bodykind customers. If you have tried this product we'd love to hear what you think so please leave a review.